Caspase-8 activation plays an important role in the death receptor-mediated extrinsic apoptotic pathway in human cancer cells . When binding to ligands, the death receptor is activated and forms the death induced signal complex (DISC) together with FADD and procaspase-8. Procaspase-8 is activated and initiates the caspase cascade which mediates cellular apoptosis. c-FLIPL is a major protein that can prevent caspase-8/10 activation in the DISC and inhibiting apoptosis mediated by death receptors. 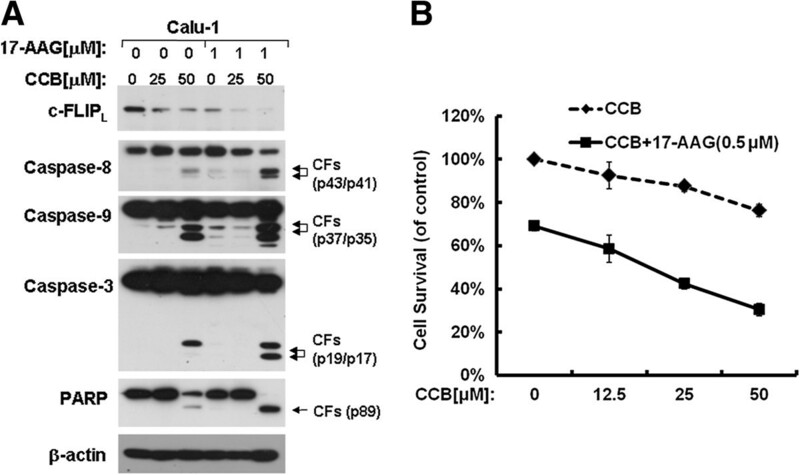 It has been found that c-FLIPL is up-regulated in several carcinomas [2, 3] and overexpression of c-FLIPL can be responsible for chemoresistance and malignant transformation [4–6]. To date, more than 10 splicing variants of c-FLIP genes have been identified at the mRNA level. However, only c-FLIPL and c-FLIPS have been extensively studied at the protein level. Although these two splicing variants have distinct structural and functional properties, they have been found to be recruited to DISC and to inhibit caspase-8 activation. Recent studies have shown that c-FLIPL degradation is dependent on JNK-mediated E3-ligase Itch and AKT phosphorylation, while degradation of c-FLIPS seems to have different pattern [7, 8]. Hsp90 is a pleiotropic molecular chaperone and functions as a key protein in the conformational maturation and stability of client proteins, many of which are kinases, cell cycle regulators and steroid receptors, etc. . These client proteins play important roles in signaling transduction, cell proliferation and cancer chemoresistance. The Hsp90-based molecular chaperone complex interacts with its client proteins in an iterative way. Hsp90 cycles are driven by ATP- or ADP-bound conformations that are mediated via multiple rounds of ATP binding and hydrolysis . Hsp90 inhibitors such as geldanamycin (GA) or its synthetic analogue 17-AAG, directly binds to the ATP-binding pocket in the N-terminal domain of Hsp90 and, hence, blocks the binding of nucleotides to Hsp90. Once Hsp90 activity is inhibited, the Hsp90-dependent protein dissociates from the multi-chaperone complexes and is targeted for degradation by the ubiquitin-proteasome system [10, 11]. 17-AAG-induced apoptosis has been previously reported to be associated with c-FLIPS down-regulation . However, the relationship between Hsp90 and c-FLIPL has not been well elucidated. C-terminus of Hsp70-interacting protein (CHIP) has the E3 ligase activity, and it binds to Hsp/Hsc70 and Hsp90 complex by means of its TPR (an amino-terminal tetratricopeptide) domain . It has been reported that CHIP degrades Hsp90 client proteins, such as the glucocorticoid receptor, the cystic fibrosis transmembrane-conductance regulator and ErbB2 [13–15]. In this study, we show that CHIP is involved in c-FLIPL degradation induced by Hsp90 inhibition. Since both Hsp90 and c-FLIPL play a critical role in oncogenesis and chemoresistance, inhibition of Hsp90 by 17-AAG in combination with therapeutic agents targeting c-FLIP may be an efficacious strategy in patients with tumors that express high levels of c-FLIPL and other Hsp90 client proteins. 17-AAG-induced apoptosis has been previously reported to be associated with c-FLIPS down-regulation . However the relationship between 17-AAG/GA and c-FLIPL has not been well elucidated. In this study we examined the effect of c-FLIPL expression induced by 17-AAG or GA in lung cancer cell lines including Calu-1, A549, H460 and H157. After treatment with 17-AAG and GA at the indicated concentrations for 48 h, c-FLIPL levels were reduced (Figure 1A and B). We also performed time course experiments to monitor the expression of c-FLIPL. Calu-1 and H157 cells were treated with 17-AAG (1.0 μM) or GA(4.0 μM) for the indicated time. We found that the c-FLIPL expression decreased in a time-dependent manner. In Calu-1 and H157 cells, the time of c-FLIPL down-regulation occurred as early as 4 h and was sustained for at least 48 h following 17-AAG or GA exposure (Figure 1C). 17-AAG and GA induces c-FLIP L down-regulation in NSCLC cells. (A) and (B), Calu-1, H157, A549 and H460 cell lines were treated with either 17-AAG or GA at the indicated concentration for 48 h. (C), Calu-1 and H157 cells were treated with 1.0 μM 17-AAG or 4.0 μM GA for the indicated time. The cells were subjected to preparation of whole-cell protein lysates and c-FLIPL proteins were detected by Western blot analysis. It has been reported that c-FLIPL degradation is correlated with ubiquitin . 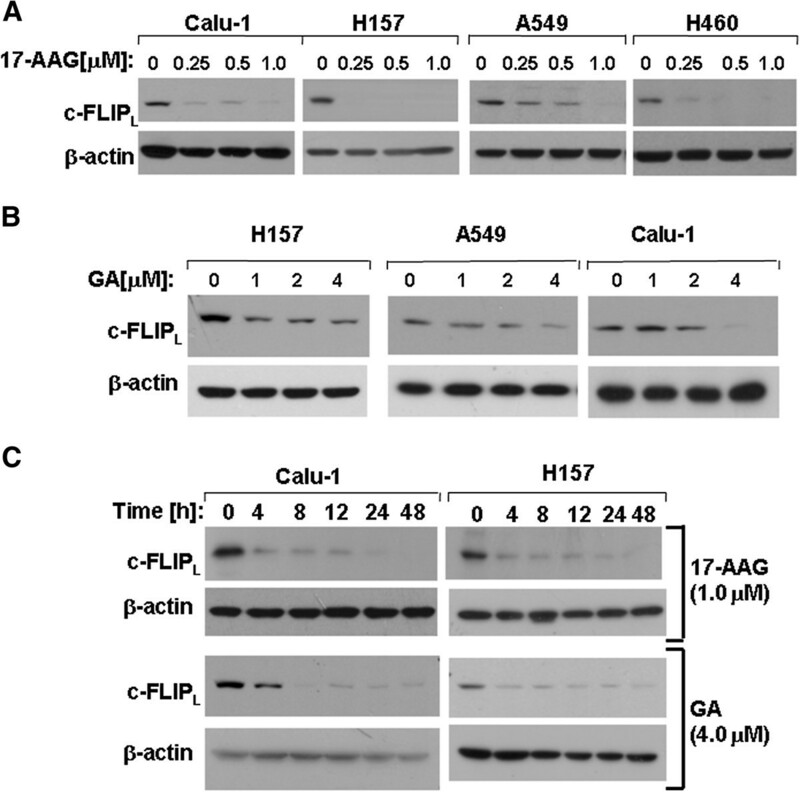 To determine whether 17-AAG induces proteasome-mediated c-FLIPL degradation, we tested the effects of 17-AAG and GA on c-FLIPL expression in the absence or presence of the proteasome inhibitor MG132 in Calu-1 and H157 cells. As shown in Figure 2A and B, MG132 at the concentration of 20 μM abrogated the ability of 17-AAG and GA to reduce c-FLIPL, suggesting that 17-AAG- and GA-induced c-FLIPL down-regulation is dependent on proteasome-mediated degradation pathway. 17-AAG and GA induce c-FLIP L down-regulation via proteasome pathway. Calu-1 and H157 cells were pretreated with 20 μM MG132 for 30 min and co-treated with the indicated concentrations of 17-AAG (A) or GA (B) for 4 h, and then the cells were subjected to preparation of whole-cell protein lysates and c-FLIPL proteins were detected by Western blot analysis. It has been documented that 17-AAG and GA induced degradation of Hsp90 client proteins . Since we detected that c-FLIPL down-regulation was induced by 17-AAG and GA, we wondered whether c-FLIPL was a client protein of Hsp90. We knocked down Hsp90α/β with siRNA and then detected the c-FLIPL and Hsp90α/β protein levels by Western blot. 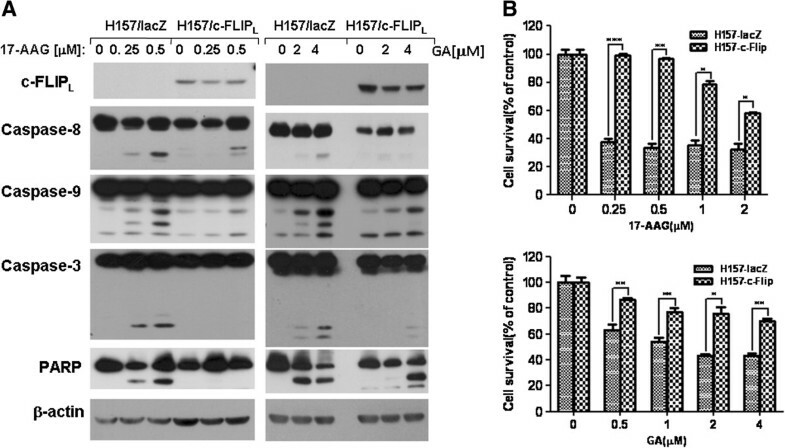 Hsp90α/β protein levels were reduced after knockdown, and the c-FLIPL level was also decreased compared to the control (Figure 3A and B), suggesting Hsp90 controls the stability of c-FLIPL protein. Inhibition of Hsp90 expression facilitates c-FLIP L down-regulation. 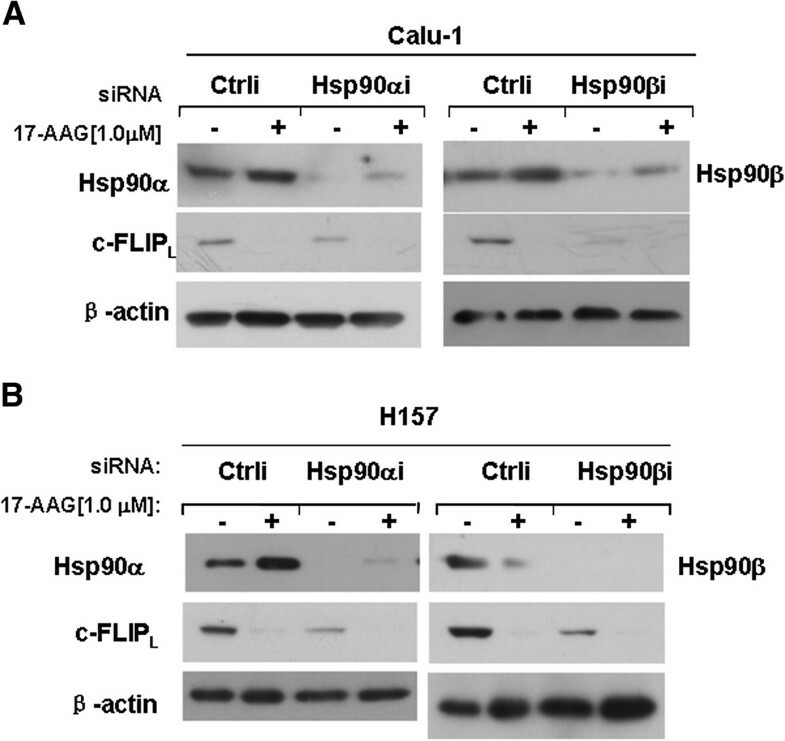 (A) and (B), Calu-1 and H157 cells were transfected with siRNAs of control, Hsp90α and Hap90β, respectively. Twenty four hours later, cells were treated with 1.0 μM 17-AAG for 48 h. The cells were harvested for Western blot analysis to detect Hsp90α/β and c-FLIPL levels. CHIP interacts with Hsp90 chaperone complexes and displays E3-ligase activity to degrade Hsp90 client proteins [13, 15]. In order to detect the interaction of CHIP with c-FLIPL, we explored dose experiments in Calu-1 and H157 cells. We found that c-FLIPL level was reduced while CHIP expression was slightly increased after treatment with 17-AAG (Figure 4A and B). Furthermore, when CHIP was knocked down, the degradation of c-FLIPL was abrogated (Figure 4C) in Calu-1 and H157 cells, which indicated that c-FLIPL degradation was modulated by CHIP. CHIP is involved in c-FLIP L degradation. (A), Calu-1 and H157 cells were treated with the indicated concentrations of 17-AAG for 48 h. (B), Calu-1 and H157 cells were treated with 1.0 μM 17-AAG for the indicated time. (C), Calu-1 and H157 cells were transfected with control siRNA (Crtli) and CHIP siRNA (CHIPi). 24 h after transfection, cells were reseeded and treated with 1.0 μM 17-AAG for 48 h. (D), Calu-1 cells were transfected with pcDNA-Myc-CHIP plasmid, and the cells were treated with 20 μM MG132 and 1.0 μM 17-AAG for 4 h. For immunoprecipitation, cell lysate was incubated with Myc antibody for 1 h and then incubated with protein A/G agarose(1:1 mix) at 4°C overnight(Left panel). Calu-1 cells were transfected with Lenti-Flag-c-FLIPL, and the cells were treated with 1.0 μM 17-AAG and 20 μM MG132 for 4 h. For immunoprecipitation, cell lysate was incubated with Anti-FLAG M2 beads at 4°C overnight (Right panel). The precipitated proteins were analyzed by Western Blot assay. (E), H157/c-FLIPL cells were transfected with plasmids Ub-HA and pcDNA-Myc-CHIP or pcDNA-Myc-CHIP(H260Q mutant), and then the cells were treated with 1.0 μM 17-AAG and 20 μM MG132 for 8 h. The cell lysates were subjected to immunoprecipitation with Flag antibody and subsequently Western Blot analysis. To further test if there is physically interaction between CHIP and c-FLIPL, immunoprecipitation experiments were performed. Calu-1 cells were transfected with plasmids carrying Myc-tagged CHIP or Flag-tagged c-FLIPL and then treated with 1.0 μM 17-AAG for 4 h, the lysate supernatant was incubated with Myc antibody for 1 h and then with protein-G and protein-A (1:1 mix) beads overnight (left panel), or anti-FLAG M2 Affinity Gel beads overnight directly(right panel). Western Blot analysis showed that CHIP and c-FLIPL proteins were both detected in the immunoprecipitation complexes, suggesting that both exogenous and endogenous CHIP interacts with c-FLIPL physically in vivo. Hsp90 was also pulled down together with c-FLIPL and CHIP, suggesting that CHIP interacts with c-FLIPL in an Hsp90 chaperone complex (Figure 4D). Considering CHIP can be an E3 ligase, we wonder if it can regulate the ubiquitination level of c-FLIPL. H157-c-FLIPL cells were transfected with plasmids carrying Myc-tagged CHIP or Myc-tagged CHIP (H260Q Mutant) and then treated with 1.0 μM 17-AAG for 8 h. After immunoprecipitaion with Flag antibody, Flag-tagged c-FLIPL was pulled down. 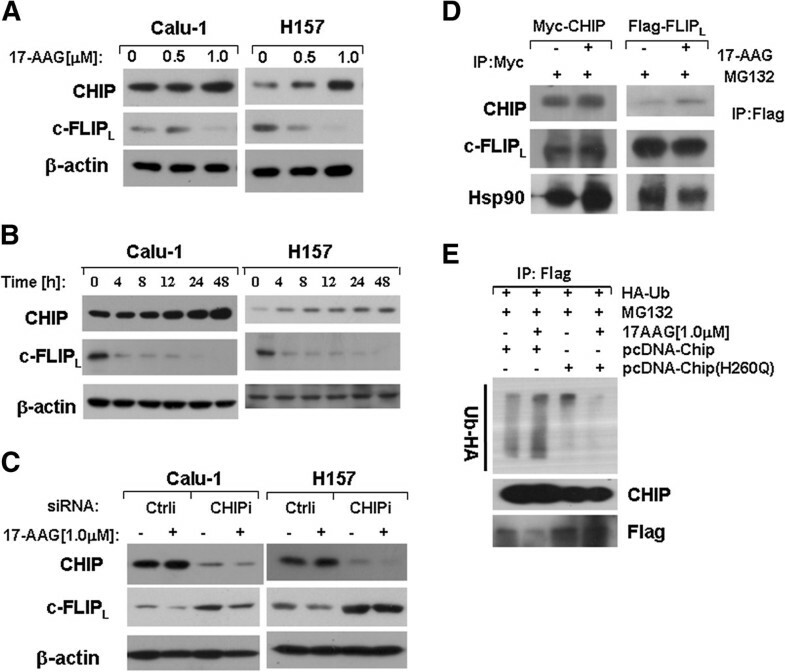 Western Blot analysis showed that CHIP overexpression promoted the c-FLIPL ubiquitination, while the mutant CHIP overexpression suppressed the c-FLIPL ubiquitination after 17-AAG treatment (Figure 4E). Taken together, our data suggest that CHIP interacts with c-FLIPL in vivo and promotes the ubiquitination of c-FLIPL. To determine the effect of c-FLIPL overexpression on 17-AAG- and GA-induced apoptosis, two cell clones H157-c-FLIPL and H157-LacZ that overexpress c-FLIPL and LacZ respectively were used to examine their effects on 17-AAG- and GA-induced caspase activation and apoptosis. By Western blotting, we detected high levels of ectopic c-FLIPL in the H157-c-FLIPL cell line. We found that 17-AAG or GA induced activation of caspase-8, caspase-9, caspase-3 and cleavage of PARP in H157-LacZ control cells, as demonstrated by increased levels of cleaved bands (Figure 5A). This was not seen in the corresponding H157-c-FLIPL cells. We measured the survival of H157-LacZ to be 32.4% in cells treated with 2.0 μM 17-AAG for 48 h, whereas the survival of H157-c-FLIPL cells were more than 58.1% (Figure 5B) by SRB assay. The similar result was observed for SRB assay in GA-treated cells. From the above results, we conclude that ectopic overexpression of c-FLIPL protects cancer cells from apoptosis induced by Hsp90 inhibition. Stable overexpression of exogenous c-FLIP L protects cells from 17-AAG- or GA-induced caspase activation and growth inhibition in human NSCLC cell lines. (A), H157 cells stably expressing lacZ (H157-lacZ) and c-FLIPL (H157-c-FLIPL) were treated with the indicated concentrations of 17-AAG or GA for 48 h and then the cells were subjected to Western blot analysis for detection of caspase activation and PARP cleavage. (B), H157-lacZ and H157-c-FLIPL cells were cultured in the 96-well plates and then treated with the given concentrations of 17-AAG or GA for 48 h, then the cell number was estimated by SRB assay to determine the cell survival. Differences between groups are evaluated by Student’s t-test. Columns, mean of triplicate treatments; bars, ± SD. The statistical differences between the two treatments were analyzed by two-sided unpaired Student’s t tests (*P<0.05; **P<0.01; *** P<0.001). We have reported that celecoxib (CCB) down-regulates c-FLIPL through ubiquitin-proteasome degradation . To determine whether 17-AAG enhances celecoxib-induced c-FLIPL down-regulation and apoptosis, we investigated the level of c-FLIPL expression and caspase activation by combination treatment with CCB and 17-AAG in Calu-1 cells. We found that 17-AAG combination with CCB had synergistic effects on apoptosis induction by Western blotting and SRB assay (Figure 6A and B). c-FLIPL expression decreased further when 17-AAG was combined with CCB compared with the monotherapy Calu-1 cells. In addition, the activation of caspase-8, caspase-9, caspase-3 and the cleavage of PARP were more pronounced. This data suggests that 17-AAG may enhance chemotherapeutic agent-induced c-FLIPL down-regulation and apoptosis in lung cancer cells. 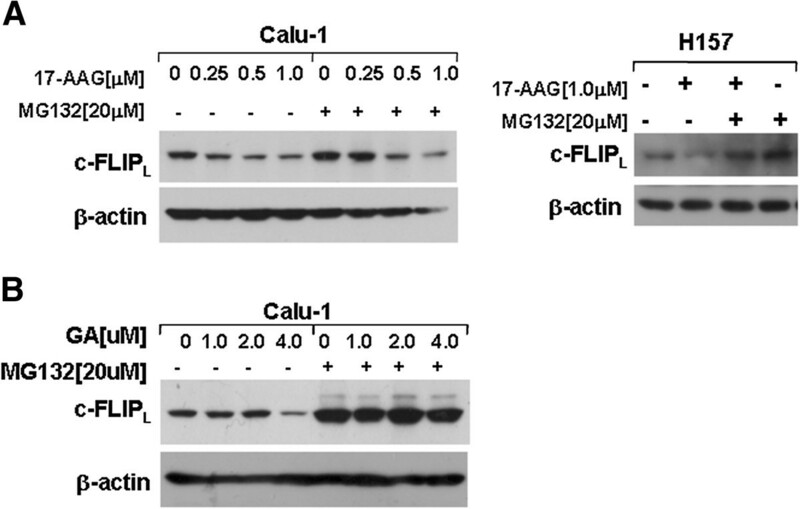 17-AAG enhances celecoxib-induced c-FLIP L down-regulation and apoptosis. (A), Calu-1 cells were treated with 17-AAG, celecoxib alone, and their respective combinations. After treatment for 48 h, the cells were subjected to detection of caspase activation and PARP by Western blot assay. (B), Calu-1 cells were seeded in 96-well plate and on the second day were treated with the given concentrations of CCB or combined concentrations of 17-AAG and CCB for 48 h, and then the cell number was estimated by SRB assay to determine the cell survival. Hsp90 plays a key role in conformational maturation and stability of client proteins in transducing proliferative and anti-apoptotic signals . In the present study we found that Hsp90 inhibitor 17-AAG and GA or Hsp90 knockdown induced c-FLIPL down-regulation which subsequently resulted in cancer cell apoptosis. Although DR5 is an important death receptor in the extrinsic apoptotic pathway, in the above experiments, we failed to detect DR5 up-regulation (data no shown). This indicates that c-FLIPL may primarily contribute to Hsp90 inhibition-induced apoptosis in lung cancer cells. Currently, more than one hundred client proteins of Hsp90 have been identified, and they are degraded when Hsp90 multi-chaperone complex activity is disrupted by the inhibitors. When we inhibited Hsp90 expression using siRNA technique and examined the c-FLIPL level, we found c-FLIPL was reduced in the cells whose Hsp90 was knocked down, suggesting that c-FLIPL is a client protein of Hsp90. It is reported when Hsp90 is inhibited, it recruits E3 ligase (e.g. CHIP) to degrade the client proteins [13–15]. When we knocked down CHIP, c-FLIPL degradation was inhibited after treatment with 17-AAG, which indicated that CHIP modulated c-FLIPL degradation in the NSCLC cell lines. Next, we performed immunoprecipitation experiments in Calu-1 cell lines. We found that CHIP was co-precipitated with c-FLIPL in the precipitated complex. We also found that Hsp90 was precipitated at the same time, hinting that c-FLIPL is the client protein of Hsp90 and CHIP modulates c-FLIPL degradation through the Hsp90 chaperone complex. Itch is reported as an E3 ligase of c-FLIPL in the mouse cells upon exposure to TNFα . However, it has also been reported that some agents induced c-FLIPL degradation independently of Itch [17–19]. Additionally, we found that CHIP promotes the ubiquitination of c-FLIP, indicating CHIP regulates c-FLIPL degradation through uibiquitination when the cells were treated with 17-AAG. It has been investigated that the clinically used anti-inflammatory drug celecoxib induces c-FLIPL down-regulation and facilitates cancer cell apoptosis alone or in combination with other agents . We found that 17-AAG and celecoxib had synergistic effects in promoting c-FLIPL down-regulation and cellular apoptosis. In addition, overexpression of c-FLIPL could rescue cancer cells from apoptosis. These data suggest that c-FLIPL down-regulation plays important role in Hsp90 inhibition-induced apoptosis in NSCLC cells. Our data reveals that c-FLIPL is down-regulated and apoptosis is induced effectively by Hsp90 inhibition, either by 17AAG and GA or siRNA technique, and c-FLIPL is degraded via proteasome-mediated pathway. CHIP modulates c-FLIP degradation induced by Hsp90 inhibition in human NSCLC cell lines. Targeting both c-FLIPL and Hsp90 may represent a promising therapeutic strategy for the patients whose tumors overexpress c-FLIPL and Hsp90 client proteins. 17-AAG and GA were purchased from LC Laboratories (Pompano Beach). Celecoxib, MG132 and Anti-FLAG M2 Affinity Gel were purchased from Sigma (St. Louis, MO). Protein A and Protein G Agarose were purchased from Roche (Mannheim, Germany). Mouse anti-caspase-3 and anti-caspase-8 monoclonal antibodies, rabbit anti-caspase-9 and anti-poly (ADP-ribose) polymerase (PARP) antibodies were purchased from Cell Signaling Technology (Danvers, MA). Mouse anti-FLIPL monoclonal antibody was purchased from Alexis Biochemicals (San Diego, CA). Mouse anti-Hsp90 antibodies were purchased from Abcam (Cambridge, UK). Mouse anti-Myc and anti-β-actin antibodies, rabbit anti-Flag and anti-CHIP antibodies were purchased from Sigma (St. Louis, MO). The human non-small cell lung cancer cell lines used in this study were obtained from the American Type Culture Collection (Manassas, VA) and were grown in RPMI 1640 supplemented with 5% fetal bovine serum at 37°C in a humidified atmosphere of 5% CO2 and 95% air. Cells were transfected with different plasmids by using the FuGene reagent from Roche (Indianapolis, IN), according to the manufacturer’s instructions. Cells were seeded in 96-well plate with an appropriate amount in 100 μL culture medium per well. On the second day, compounds or drugs were mixed in and the total volume of per well was 200 μL. Cells were treated for defined time and then cell viability was measured by sulforhodamine B (SRB) assay as described previously . The whole-cell protein lysates preparation and Western blot analysis were described in reference . Plasmids of Myc-CHIP and Myc-CHIP (H260Q) were kindly provided by Dr. Hamid Band (University of Nebraska Medical Center, USA). Lenti-Flag-c-FLIPL was constructed before . The cell clones that can overexpress c-FLIPL and LacZ were constructed as previously described . siRNAs were synthesized by GenePharma (Shanghai, China). Control siRNA and Hsp90α/β siRNA target sequences were described before . The target sequence of CHIP siRNA was 5′-AGGCCAAGCACGACAAGTA-3′. Transfection of siRNA was conducted as previously described . To precipitate Flag-tagged FLIPL or Myc-tagged CHIP proteins, cells were lysed with lysis buffer and Anti-FLAG M2 Affinity Gel beads or Myc antibody with Protein A/G Agarose beads (1:1 mix) were used to pull down Flag-tagged FLIPL or Myc-tagged CHIP proteins according to the manufacture’s instructions. We thank Dr. Hamid Band (University of Nebraska Medical Center, USA) for kindly providing the plasmids of Myc-CHIP and Myc-CHIP (H260Q). We thank Dr. Sunil Singhal for English editing. This work was supported by grants from the National Natural Science Foundation of China (31071215 and 30971307), National Science Major Project from Ministry of Science and Technology of China (2013CB910900 project 3) and Shandong Provincial Natural Science Foundation (2010GSF10218 and JQ201007).